Seward County Community College will kick off a weekend of celebration, with Nursing Capping & Pinning ceremonies at 6p.m. Friday, in the Greenhouse gymnasium. The traditional ceremony will recognize first- and second-year nursing graduates. One highlight of the evening is the expression of gratitude when nursing students present a rose to family members and others who have supported them in their studies. Graduation festivities continue at 10 a.m. Saturday, with the 47th annual commencement. More than 300 participating students will receive certificates of completion and associate’s degrees, including nursing students who also took part in Capping and Pinning. This year’s graduates also include more than 20 concurrent high school students, some of whom will receive their diplomas at their home high schools later this month. SCCC Registrar Alaina Rice said the day is her “very favorite of the year.” The weeks of planning and hands-on preparation required by campus employees pale in comparison to the students’ investments, she said. Sheina Fernandes, a 2011 alumna of SCCC, will serve as commencement speaker. SCCC President, Dr. Ken Trzaska, said Fernandes is a perfect fit for commencement ceremonies at a college dedicated to the pursuit of excellence for all, across cultures, disciplines, and languages. 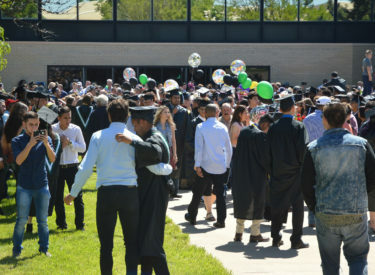 Although commencement at SCCC begins at 10 a.m., Rice encourages families to plan to arrive at 9:30 a.m. in order to park and select seating before the ceremony starts. Mascot Louie the Saint will be on hand to greet guests and take selfies. Photography services for individual photographs of graduates will be available, thanks to Collins Photography of Liberal. Following the ceremony, graduates and families are invited to a reception on the college green. To add to the festive atmosphere, Cinco de Mayo dancers, Ballet Folklorico Omawari, are slated to perform in the outdoor amphitheater adjacent to the courtyard. The day does not end after the commencement ceremony, however. Students who have earned their Kansas High School Diploma through GED testing offered at SCCC’s Colvin Adult Learning Center will graduate at 1:30 p.m., in the Greenhouse. Speakers at the event will be Uriel Rodriguez and Kelly Hornung. A reception will follow at 2:30 p.m.
SCCC Dean of Adult Education/Industrial Technology, Travis Combs, said the Colvin Center has 77 graduates, of which about 50 will participate in the ceremony. All of them, he added, reflect the mission of the college and serve as an example of how education can transform lives.